I am a rabid Scrabble fan. I own 8 boards. Two are for my own use and six were for my classroom and the annual Scrabble tournament I held. I'm keeping all 8 boards, even if I never work as a classroom teacher again. The last time I was in a thrift store, I bought an incomplete set of Scrabble tiles for $1, because a person can never have too many Scrabble tiles. April 13th was International Scrabble Day. Because of International Scrabble Day, Emma Jeffrey challenged all the Fiskateers to make a project incorporating Scrabble. I can't resist a challenge, especially a Fiskateer challenge. 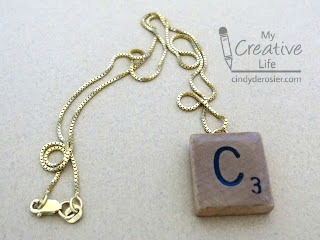 I decided to make myself a Scrabble necklace. I dug through the tiles and found a C that wasn't too beat up. I used Diamond Glaze to create a nice domed top. When it was dry, I tackled the question of how to mount the tile. The proper thing to do would have been to use a bail, but I didn't have any and didn't want to wait until I could get to a craft store to buy one. So I decided to improvise. And for that, I turned to earrings. As a teenager in the '80s, I followed the mandatory dress code of pegged pants, multiple pairs of socks, striped polo and/or rugby shirts, and large earrings that matched my socks (which in turn, matched the stripes on my rugby shirt). All my earrings were in divided containers, organized by color. I still have my huge collection. Check out just a few of the fabulous earrings from the pink section. I dug through my earring collection and struck gold - literally. I found an earring piece without a mate that would work perfectly to mount my Scrabble tile. I used E-6000 to attach it and crossed my fingers. When it was dry, I added an old chain. And here it is! My new Scrabble necklace. I absolutely love the way it turned out! Ohhhhhhhh this is FABULOUS!! I loveeeeeeeee it!! I love scrabble to! I played all the time w/ my mom when I was a little girl; I think that's why I am such a great speller! Madison has started showing an interest as well...even going as far as pulling out the game and asking me if I want to play. And I'm glad because not only is it fun to spend time w/ her but her reading/spelling skills are not so great and I am hoping this will help! Oooh Trevor's going to be so intimidated. LOL Too funny Cindy! Great project. LOVE this post!!! :) I have very fond memories of my 80s wardrobe and accessories. I believe my mom still has an old tackle box full of junk jewelry and things I fashioned to BE jewelry during those times. Love your necklace!